Are you spending a lot of money on google ads without seeing profitable results? Well, you aren’t alone! 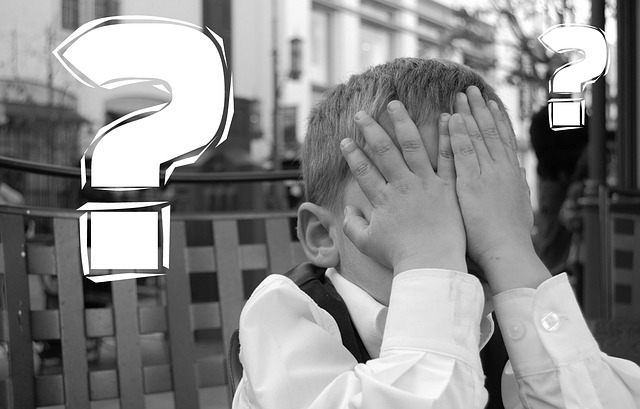 A lot of people are losing money on google ads and most can’t figure out why. Understanding google adwords helps, but it isn’t always enough. If this is you, don’t worry, i have been in your position! It’s never fun operating out of the red, luckily there is hope for everyone in this position. Today i’m going to talk to you about a tactic i use to ensure my ad campaigns are profitable. If you take the time to understand and implement this strategy, you’ll be wanting to increase your ad spend, rather than getting rid of it. Let me show you how i do it. We all know that the cost per click depends on the popularity of a keyword. High search volume keywords are always going to be competitive, afterall they bring in the most traffic. If you’ve got a keyword with a high monthly search volume and a strong level of buyer intent, you are going to be paying ALOT per click, and this is where it can become expensive. What if i told you that this doesn’t really matter, that you can go all in on these golden keywords AND your campaigns will be profitable, you’d laugh wouldn’t you. Well, you can and here is how you can do it. Let’s forget the cost of the campaign for the minute and let’s think more about where you are sending your visitor to. Some people run adverts straight to their product or service, the visitor may or may not buy the particular product and that’s that. If you are doing this and it’s working, great! But i will warn you, it might not last forever, you too may end up losing money on google ads. Look at this example. Person A runs a google ad campaign, straight to their $20 Aching Joint Supplement. On average they spend $50 a day, and sell 8 bottles of supplement, they total $160 in gross sales, not bad. Person B runs the same google ad campaign, but when a customer decides to buy a bottle of supplement, they are then taken to an “upsell page” where they can get an additional 3 bottles and save 20% on their order. Half of the customers go for the upsell, this takes their sales total to $336. Both people spent $50 in ads, but person B made double the money and this my friends is the power of a sales funnel. Do you ever sit there and wonder how people are bidding such crazy amounts on keywords? Well, this is why, these people understand the concept of a sales funnel. When i discovered this concept, it changed my business from a sinking ship to a luxury yacht, paid advertising became profitable again. So now when people tell me they are losing money on google ads, i show them this concept. 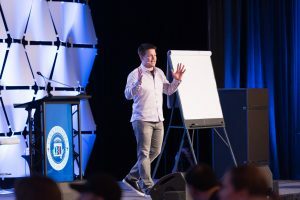 I learnt about this method when following an entrepreneur named Russell Brunson, if you have read any of my other stuff you will know that this guy did alot for me and my business. Russell Brunson is the founder of a piece of software called clickfunnels, Russell decided to create clickfunnels when he discovered the above problem for himself. He started out selling potato gun making DVD’s online, it started well but within a few months google tripled his ad cost. His campaigns were no longer profitable, he was forced to rethink his strategy. He actually partnered up with some guys that were drop shipping ready made potato guns, by adding in an upsell his google ad campaigns became profitable again and the rest is history. Because of Russell’s influence i naturally refer to a sales funnel as a click funnel, they are of course the same thing. The above example sets out a very basic click funnel, if you want to make more money you can simply add more upsells and downsells, this is the beauty of a click funnel. I’ve explained the above example in a little more detail in the following video. Most people aren’t losing money on google ads because of their adverts (although they are important). They are losing money because they are not offering enough to their customers, and this is why you need to understand the concept of a sales funnel. A sales funnel in simple terms, is the route you lead your customer down when they are making a purchase, it’s very simple. Of course there are other factors to consider, your sales copy is just as important! Why Wouldn’t You Offer More? Let’s take a step back to think about things, if you are losing money on google ads this strategy could change things. Even if your ads are successful, with this method you could be making alot more. Why wouldn’t your customer want to buy more from you? The good news is, it’s an easy fix! All you need to do is restructure your offerings, although this may sound daunting, it doesn’t need to be. I would start by looking at clickfunnels, they make the whole process alot easier. Click funnels is alot more than a landing page builder, the drop and drag functionality makes it incredibly easy to use. You don’t need to worry about hiring expensive developers or designers, you can map out your entire sales funnel on your own. It’s so simple, Russell has taught his children to use it. A lot of people i know have made the switch from the traditional website, mainly for the ease! Managing a sales funnel is much easier than a full blown website. If you think it could be helpful for you and your business there are alot of options out there. 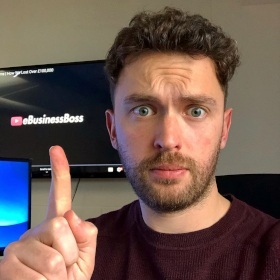 I opted for clickfunnels because it includes everything in one place, you can read my full review on the platform here, if your interested. If you want some other options, I’ve also written an article on the main alternatives. None of us want to lose money, so if your in this position, something needs to change. I love this quote, mainly because it makes so much sense! In today’s society Paid advertisement is arguably one of the biggest opportunities out there, it puts you in control. If you are relying solely on an organic search strategy, you are at the mercy of the search engine gods, a simple change in algorithm could see your sales fall through the floor! Of course that is a dramatic scenario, realistically your search rankings would fall away over time unless you were penalized for a specific reason. Using google adwords works, you work on your offer, set out your funnel and off you go, with a few clicks you can be on page one. When you think about it both SEO and Paid advertising require time and investment, but i’d argue that you have more control with paid adverts. If your google ad campaigns are not profitable, you need to rethink your strategy, go back and look at what you are offering! Compile a list of your competitors and see what they are doing. I think there is a lot of value in reverse engineering, if a competitors strategy is working, go out and buy their product, see what cross promotions you are hit with. If you know that what they are doing works, then you can replicate it. Do you ever sit there trying to figure out how a competitor is offering such a low price? I used to do it all the time! This was until i understood the concept of a value ladder, understanding this changed my perspective on everything. Some companies will even offer products or services free of charge, but why is this? Let me give you a real life example. Mike runs a dentist surgery, he offers all sorts of services from teeth whitening to general check ups, and surgery. Mike decides to run an advert on google, he targets people that live within 15 miles of his surgery. He offers a free teeth cleaning appointment to the first 50 people that get in touch. Within a few days the surgery has booked in 50 people for their free teeth cleaning session. Every appointment is an opportunity for Mike to get to know the customer. At this stage Mike can lead the customer up the first step of his value ladder, by offering his teeth whitening services. A lot of the customers will take him up on this offer, they now trust Mike, after all he has just cleaned their teeth for free! With some customers, Mike also notices that their teeth could be straighter. He asks if they’d be interested in having a retainer fitted, some will say yes and again the customer has moved another step, up the value ladder. 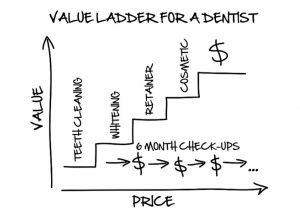 Some customers teeth may require a little more than just a retainer, in which case Mike can offer them cosmetic surgery to solve the problem once and for all (another step up the value ladder). From the outset some people would of thought Mike was crazy! He was paying for google ads to then offer the customer a free service, this not only costs Mike but it also takes up his time. As you can see, Mike knew what he was doing and each was led straight into his sales funnel. At the top of the value ladder, Mike could offer a continuity plan, for a monthly subscription they could save on regular check ups and appointments, whilst also benefiting from other discounts on purchases etc. As you can see Mike understands the power of combining a sales funnel with a value ladder. Your competition may be offering something similar, on the face of things they too may be losing money on google ads, but as you can see it’s for good reason. Whatever your product or service, you can go out and find out what your competitors are offering. If your in the service industry you can hire somebody to go through their funnel, at your expense. What ever you sell, i’d encourage you to reverse engineer your most successful competitor, once you know what they are offering you can work on putting together something better. Do you think a sales funnel would improve for your business? Before you turn off your google ads, look at what you are offering, are you leading your customer through a sales funnel? Focus on providing your customers with as much value as possible, understanding this concept can result in a never ending stream of life long customers. The quality of your customers experience must come first. Alot of people are ditching the standard website and turning to software like clickfunnels, i don’t blame them either! It’s easy to use and easy to build out your very own sales funnel. You don’t have to lose money on google ads, if your in this position i’d recommend looking at your sales funnel, it might well change your life. When it comes to building out sales funnels, clickfunnels isn’t your only option! It’s good to consider the alternatives, i’m sure like me you are looking for value for money. I looked at the other options and decided that clickfunnels offers the best value for money. But we are all different! Anyway, I hope you’ve found this article useful, i’d love to hear your thoughts in the comments below!